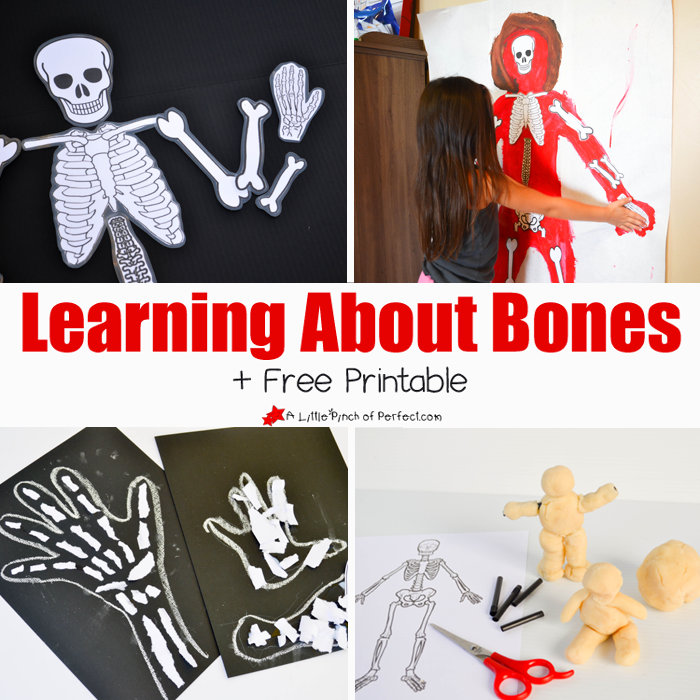 We have been having fun learning about bones using our free printable skeleton, building with playdough, making a craft, and singing. Now when the kids see skeletons this Halloween they aren’t scared because they know we all have a skeleton! We have been singing and dancing to the Youtube video Shake Dem Halloween Bones by the Kiboomers. 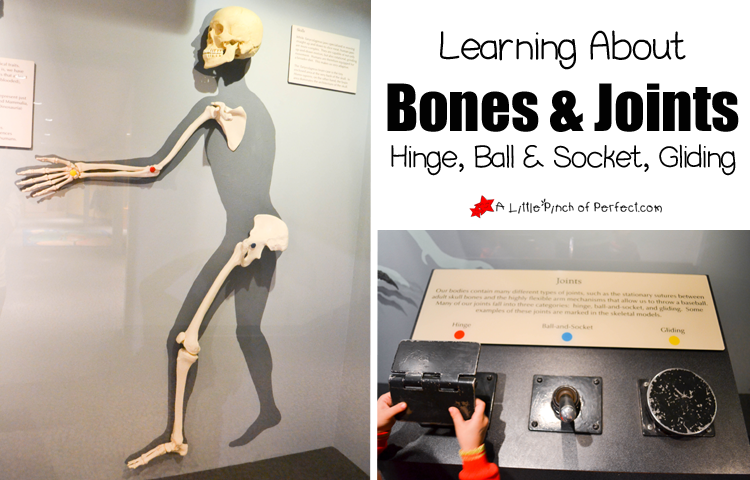 We went on a field trip which has an exhibit of bones and joints to explore. The kids loved seeing a skeleton on someone else’s wall too! We didn’t go into much detail about joints. We located them in our body and moved around using the joint we found. Here are two Skeleton books that are super silly for Halloween. Here are two Skeleton books for kids that are educational. 1. 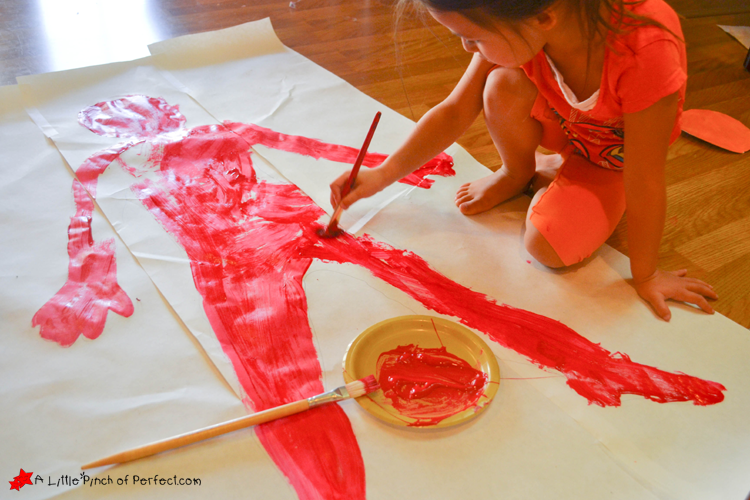 Have child lie down on the paper and use the pencil to trace around them. My daughter couldn’t stop giggling as I traced around her because it tickled. 2. Paint the paper, filling in the outline. My daughter chose red paint to look like blood. A bit gross and totally awesome because she totally got into the spirit of this activity! You could skip painting, but I do recommend using a thick pen to outline the body. Once our paint was dry we hung it on the wall to do the rest of the activity. 3. Talk about bones and place them on the paper. 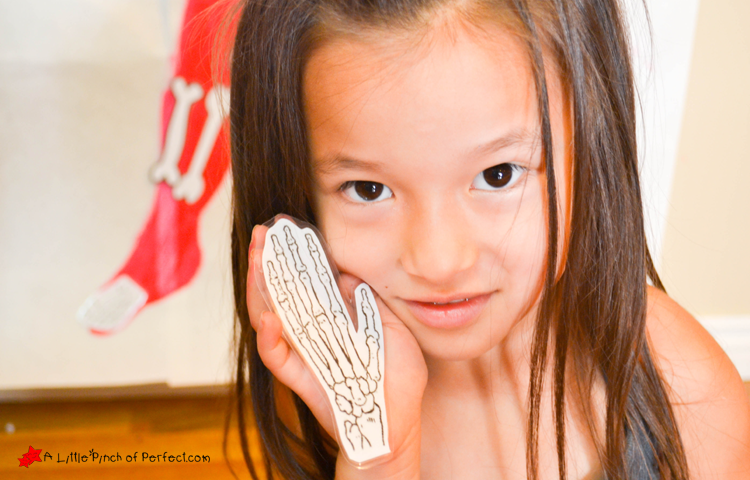 As we discussed each bone we pointed to it in our body and poked ourselves so we could feel it. My daughter also liked putting the skeleton piece on her body before sticking it to the paper. 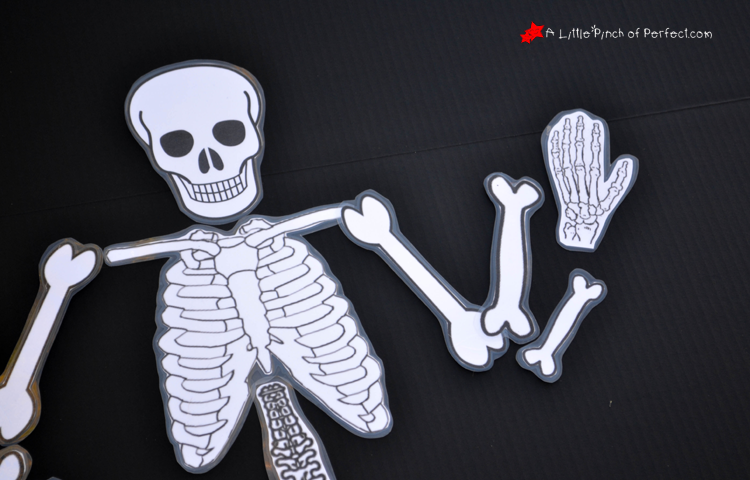 We talked about what the bone helps us do (ribs protect our heart and lungs, leg bones help us stand and walk, fingers help us pick up things…). 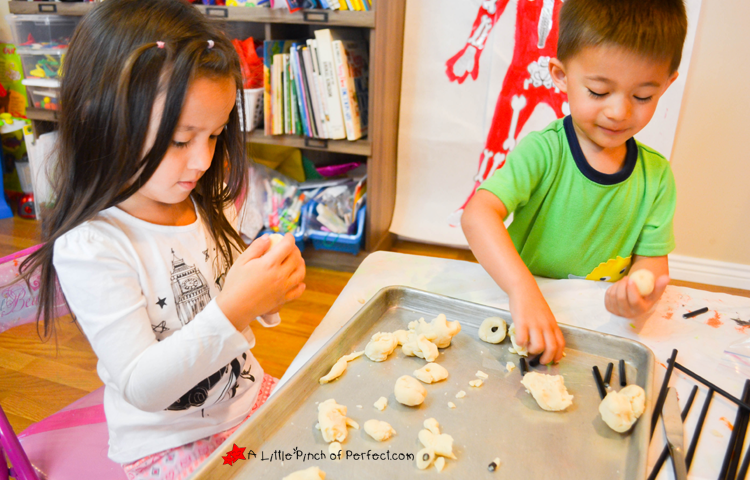 Skeleton Playdough Activity: Why do I Have Bones? Have child build to bodies using straws in one to represent bones, and no straws in a second one to represent a body without bones. If your child is having difficulty building a body you could have them build a leg with and without a straw to complete the activity. We found it easiest to make each part, stick a straw into it, and then cut the straw leaving extra length to attach it together. After our playdough creations were made we tried to stand each of them up. Our boneless playdough body fell over and felt weak, but our playdough body with straw bones stood tall and felt strong even when we squished them with our hands. Now I know the printable skeleton bones aren’t completely correct but I didn’t have time to draw a skeleton so I worked with what I could find making sure the printable had 3 leg bones and 3 arm bones instead of just two–which seems to be typical for available graphics. With that said, it worked great for my kids and looks perfect hanging on our wall for Halloween. Another note: I made the skull a bit larger than the one we used because our skeleton looks a bit pin headed :). It’s always a good idea to laminate (affiliate link) printables or put them in a dry erase pouch like our homemade one. While you are here, take at look more of our Free Printables. Thanks for learning with us today! Please click here to sign up for our weekly newsletter and follow us on Facebook, Pinterest, Twitter, and Youtube. Hi Erin, Thanks so much!